In the late second and early third century Origen of Alexandria put together an edition of the Bible that contained six different translations. From ancient testimony and the few fragments that survive, we can determine that he placed six different translations side-by-side in columns. The languages he used were Hebrew and Greek (the Greek columns represented various translations of the Old Testament). Unfortunately the Hexapala was lost in the fire of the great library at Alexandria. 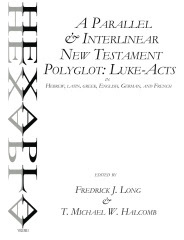 More recently, Fred Long and Michael Halcomb have compiled a new Hexapala based on Origen's concept, but with a different focus. Rather than compare the Hebrew text to four or five Greek translations, they have complied a New Testament that includes six translations: Hebrew, Latin, Greek, English, German and French. And instead of putting each language in a separate columns they are presented in interlinear format so that you our eyes can read a verse in one language and then drop to the next one. Here is a link to some samples. So why do we need this poyglot and why these languages? What Long and Halcomb have done is to provide us with a New Testament that will help all of us to keep up with our various biblical and research languages. The copy they sent me is of Luke and Acts. This will be the first time that I will read those books in Hebrew. You can buy the book for $17.99 on Amazon, which seems like a steal for such a thick book. I just couldn't picture this - but appreciated the sample. Interesting.